Sean ~ Jamie ~ Reesa Stutzman: Merry Christmas and Happy New Year! As we reflect upon the last year it is amazing all that has taken place in our lives. In March the bliss of being new parents was shattered when we found out Reesa was suffering from an incurable disease called Krabbe. The shock and sadness was unbearable and indescribable. Since then our life has been a whirlwind of hospital visits, surgeries, tests and doctor's appointments. Our home has been a revolving door with friends and loved ones showing support for us and our little girl. Many wonderful people have become a part of our world including nurses, therapists and hospice workers. From local doctors like Reesa's pediatrician, Dr. Barcellona, to Reesa's specialist in Pittsburgh, Dr. Escloar and her team. We've also become close with a network of families dealing with Krabbe and other terminal diseases. Our lives have become more enriched through the inspiring people we've met. Children's toys, high-chairs and baby bottles have been replaced with a feeding machine, suction device, pulse oximeter, oxygen and hourly medications. It is certainly not what we pictured parenthood to be but we've become accustomed to our new normal and have grown to embrace it. Through our tragedy we've gained a new perspective on how beautiful people can be. We participated in St. Louis Cardinal Manager Mike Matheny's golf tournament where complete strangers opened their hearts to us and Baby Reesa. Our dear friend Skip Schumaker organized a benefit for Reesa where most of the St. Louis professional athletes signed autographs for thousands of fans. We had a once-in-a-lifetime opportunity in July at Baby Reesa Night at Busch Stadium where we threw out the first pitch in a Major League Baseball game. Local friends and coworkers put together a charity golf tournament for Reesa's first birthday party with hundreds of attendees showing their support. Although, for the most part, we've been consumed with positivity we've also had to part ways with a few "family" members who weren't supportive of us and (believe it or not) were not accepting of Reesa. This was hurtful and disappointing but, thankfully, that chapter is behind us and we're stronger from it. As 2012 comes to a close we'd like to say thank you to all of the people who've written us, supported us and prayed for us. We're so grateful for the many people who've been touched by Reesa and who have joined us on this journey that we continue to travel. We have bad days and profoundly sad moments but overall we're happy and we truly cherish everyday we have with our little princess. Reesa is comfortable, content and showered with love every moment of her life! This was a beautiful, wonderful family Christmas. The best of life are the little moments and experiences. 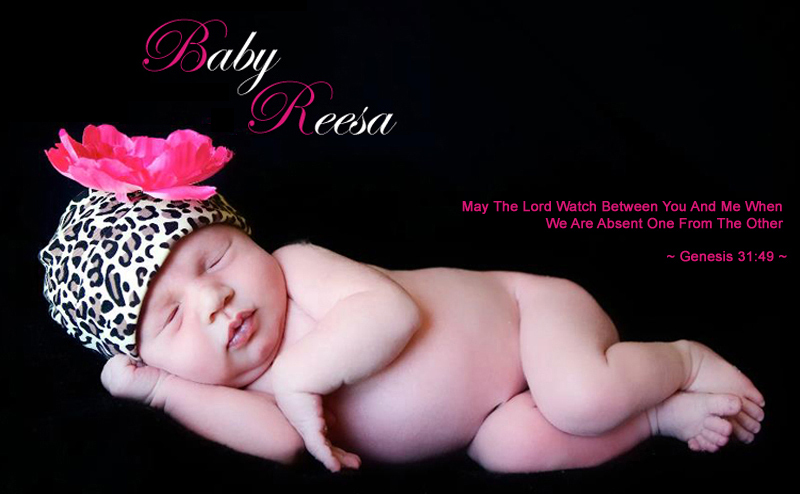 It took Baby Reesa an Angel from God to teach me and I think many others what is truly important. Thank You Sean and Jamie for sharing the photos and especially these most precious videos of Reesa at Christmas. I just wanted to reach out and hug her. As I celebrated Christmas day with my family my thoughts were with your family. You all are constantly in our thoughts and prayers. It was one of the highlights of my family's year was getting to know all of you and having the chance to raise awareness of Krabbe disease across the nation. God bless all of you! I just want to say hello to you and to let you know you're in my thoughts and prayers. Whether you employ bottles solely or provide baby each breast milk and bottle milk, the vital factor is that each you and baby ought to be happy and healthy. If you, as a mother, area unit proud of the manner things area unit going, then your baby, too, are going to be happier, for more information visit here Shara.